Family and Friends Weekend is almost upon us and if you’re anything like me, you want to use this as a reason to finally get off campus, but you don’t have a clue what to do. Luckily, I went and did some research on exciting activities taking place this weekend. So without further ado, here are four fun things to do this weekend in Boston that your parents will probably enjoy, too. Are you a fan of music, art or food? 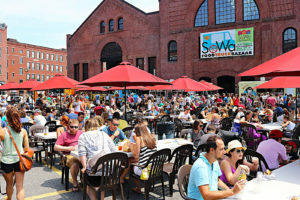 If yes, then you should check out the SoWa Open Market. The market is open every Saturday and Sunday from 10 a.m. to 4 p.m., and it’s a great way to support small businesses. Also, meat eaters will enjoy this weekend’s Sausage Fest, which means all the food trucks will be serving some sort of sausage. The market is located on Harrison Avenue in the South End. This is a weeklong “civic collaboration” festival founded by The Boston Globe, Harvard University, Massachusetts General Hospital and Massachusetts Institute of Technology. It hosts speakers and events focused on the intersections between art, science, entrepreneurship and technology. In addition, there is a physical “hub” — and the central site of the festival — at City Hall Plaza from Oct. 12 to 15. Do you want to see Boston’s historical architecture but would rather not walk around for 5+ hours? Then you might want to take part in one of the Charles Riverboat Company’s architecture cruises. Travelling down multiple waterways, it showcases both historical and contemporary buildings in Boston and Cambridge. Tickets can be purchased here. This Saturday is the season opener of the orchestra, and a concert will be held in Paine Hall at 3 Oxford St. in Cambridge 8 p.m. The concert is free of charge and open to the public. Tickets can be reserved here.